There is no national registration of companies in the USA. All businesses are registered at the county or state level. Listed below is how to register in Massachusetts. The state or counties will not check (or care) if your name conflicts with names of other businesses in other states! Sole Proprietorships and private partnerships are registered at the County level in Massachusetts. This includes Fictitious Business Name statements (also known as “DBA”s). In most cases the fee is under $50 and anyone can register a business simply by visiting your county’s business office and completing the right paperwork. Visit the business registration office of your county clerk to complete the paperwork. 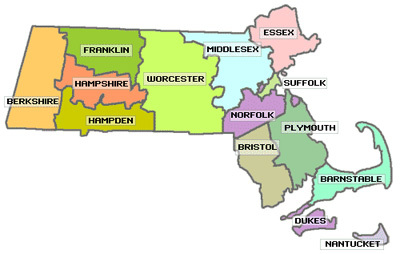 The counties of Massachusetts include Berkshire, Franklin, Hampshire, Hampden, Worcester, Middlesex, Norfolk, Essex, Suffolk, Bristol, Plymouth, Barnstable, Dukes and Nantucket. No wonder this is part of the country is known as New England! Trademarks: Massachusetts does have its own trademarks and service marks and has switched to using the same international trademark codes as used by the USPTO. However, Massachusetts trademarks provide you no protection outside the state, so it is recommended that you file instead proper federal trademark applications with the US Patent and Trademark office. Sales Tax: In Massachusetts retail sales tax is the same in all counties and is currently 6.25%. If you will be selling taxable good or services (which is often the case unless you only sell to resellers), you will need a tax id from the Department of Revenue. Largest Cities: Boston, Cambridge, Lowell, Worcester, Springfield, Pittsfield, New Bedford, Martha’s Vineyard, Nantucket, Provincetown, Weymouth, Peabody, Gloucester, etc. The Massachusetts Bay Colony was named after the indigenous population, the Massachusett. It has been translated as "near the great hill", "by the blue hills", "at the little big hill", or "at the range of hills", referring to the Blue Hills, or in particular, Great Blue Hill, located on the boundary of Milton and Canton. 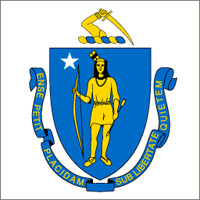 The state is known as The Bay State, though other nicknames include The Old Colony State, The Codfish State and The Tea Party State.